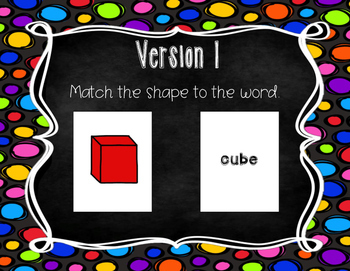 There are THREE differentiated versions of this game. 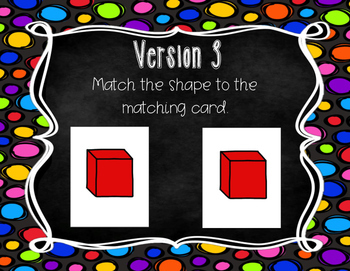 18 Shapes for each version, or 36 cards per version! Students take turn picking 2 cards. 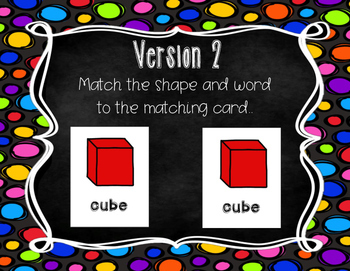 If the shapes are a match, student gets to keep that pair and go again. If it is not a match, student places their cards back and next player gets a turn. Player with the most pairs wins. 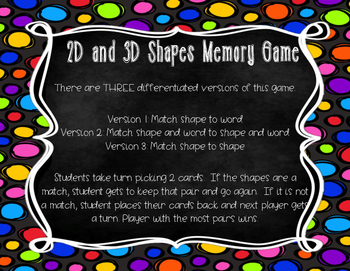 I use this as a math center game with partners or groups of 3. Square, cube, tall rectangle, wide rectangle, rectangular prism, circle, sphere, trapezoid, cylinder, square base pyramid, triangle, cone, pentagon, octagon, hexagon, star, parallelogram, and rhombus.